I am sick and been wanting something to keep me up and about. 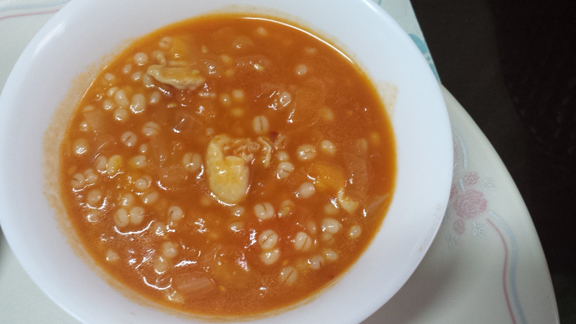 We had a bounty of tomatoes from Tarlac and decided to make some fresh tomato soup. This was pure tomatoes, about 20 pieces of them, with the addition of a couple of tablespoon of tomato paste, stock, and barley. I actually wasn’t sure of using barley. But it was available, and it sounded healthy and good. So I started out making a tomato sauce. Then added the tomato paste and some water and powdered stock. Then with a bit of tasting, I adjusted it with a bit of spice and salt. Then a handful of barley. Prepare the tomatoes before hand. Saute the onion and tomatoes in the rendered chicken or pork fat, along with the strained tomato juice. Then allow the tomatoes to cook down. This might take a while, especially if your tomatoes are not that ripe yet. Season with salt. Add the tomato paste. Adjust seasoning, and add some heat if you want. Add the stock and the barley and allow the barley to get cooked. Serve hot 🙂 You may opt to serve with some cream as well.